This is a card made by the company Anne Taintor. Usually, I keep it on my desk, but here it is pictured propped up on the door of our toaster oven. 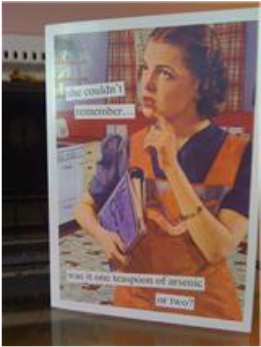 It might be hard to read, but the card says "she couldn't remember... was it one teaspoon of arsenic or two?" I think that is a funny twist on cooking. Or not cooking. Long live the ideal of the non-cook, which is, naturally, to exercise the not cooking. But hello reality. For many of us, the not cooking is elusive. Cooking must be done on account of our responsibility to our children, our beloved, or ourselves, and so the not cooking gets set aside. We feel weird about shirking. We cannot shirk! Still, the block against cooking is so substantial that it cannot be moved, broken down, or worked around. We are paralyzed, though not always literally. Sometimes we are paralyzed figuratively, which has a very unfortunate effect on the food. Yet there is something that can be done, and here it is: The block must be avoided. Naturally, obviously culinary words should be avoided if not totally expunged from your vocabulary. You will not miss them. You do not favor them anyway, because they have disturbing connotations. You do not need these words that upset you. Words like baste, for example, are unnecessary. How about squirt? You are squirting the chicken. Never sauté, and don’t try to fry; even browning is risky. Just let the butter melt and start moving the onions around in the hot pan. Oh, and you better use some kind of an implement to do that, ok? Keep it moving. If something starts to feel too cooky, try another way of looking at it. It’s true that all these separate verbs are adding up to something and that the something is cooking, but you don’t have to pay any attention to that. Keep your mind on what you’re doing! Push the onions around. Check the flame. Pushing and checking are things you can do. Surely you have done plenty of pushing and checking before. Who cares if this time, there happens to be an onion involved. Your pushing and checking skills are just fine. In fact, you are a great pusher and an even better checker! Plus, you are a non-cook. You are certainly not going to let an onion dictate your ability to perform basic operations. Next it’ll be telling you when to laugh. Or cry. However, if you are just having too much trouble escaping from this intimidating fact of food being cooked and you, a blocked cook, being behind the whole unlikely affair, think about something else completely. Daydream. Space out. Forget about the onions totally. Don’t push. Don’t check. Take some time executing this intervention. Make sure all feelings of jittery intimidation and anxiety have passed. If the onions burn while you are attending to this very important job of the non-cook, well, what can you say? You went for self-preservation. And you are unscathed. Better the onions than you.